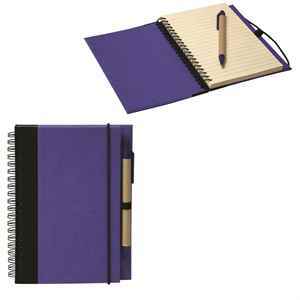 Ideal for your next conference, this eco friendly recycled cardboard custom promo notebook includes 70 pages of lined recycled paper, a pen loop with matching colour recycled pen and black elastic cord closure. Put your company logo on this spiral bound recycled cardboard custom promo notebook featuring a black pen loop with matching coloured paper pen, a black elastic cord closure and 70 sheets of lined recycled paper. There is no extra charge to insert your own pen. No extra charge to insert your own pen. 5.5"" W x 7"" H x 1"" D"